About: Prime Cars provide a 24hr minicab and chauffeur driven service. A courier service is also available. I have been using Prime for many years and have always found them to be a nice and friendly however they have turned up a bit late on occations but have always been very apologetic. Beware of this company, they will quote you for a journey but charge you more. On the whole very prompt on arriving, polite, cars clean. Generally the drivers know how to avoid traffic jams and diversions (very important in London) by taking side roads. Reliable, friendly and competitive prices. I use them regularly AND they took me to hospital when I was in labour and were very considerate. Would recommend anytime!! The rating for this review is no longer counted due to a response being added, see below for the official response. The driver picked me up 45 minutes late and was very rude. I will never use this service again and will tell everyone to avoid prime cars. Sorry to hear about your bad experience with us, if you could please let us know your booking details so we can track which driver it was. 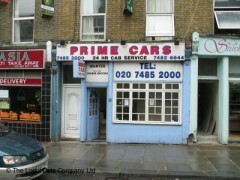 we have a booking on the 14/3/13 from crouch end which was passed to another minicab office in the same area. If you can confirm this then we can let this office know that the driver was rude. polite, reliable, clean cars, safely driven. good price. what more can I say. Have been using for years. I use Prime regularly and find them very helpful, particularly Abdul (night controller). I have on occasions left to the last minute but Prime have always accomodated me within 15 mins. There has been occasions where I have been delayed but I was informed well in advance. Most drivers are nice and helpful, well presented and have clean cars. Their rates are very competetive, and you can always rely on them to be on time for an airport transfer. I think everyone should atleast try them once to see how good they are! Excellent service & clean cars. Their prices are very cheap too. I used prime cars to transport friends and family at my wedding. They did a great job and were extremely reliable. There are also very competitively priced. I have also used them several times getting around london and going to airports and they have always proved extremely reliable. I definitely have to agree with the first review - prompt, extremely quick and very very cheap, anyone who needs a cab at lastminute.com - this car service will never let you down. A definate first choice for anyone living in Hampstead, Kentish Town, Camden Town, Islington....the list can go and on! Quick, cheaper than most other car services. A natural choice for anyone living in Hampstead.